Google's latest doodle is a brain twister befitting the man it is meant to honor -- the late British mathematician Alan Turing, who would have turned 100 on Saturday. Without Turing's work, computers as we know them would not exist, or at least the trajectory of their development would have been altered or delayed. As the first to map out the digital universe, his work now lies at the root of everything involving computer science. "A polymath of the highest order, Turing left a list of achievements stretching far beyond the realm of computer science," wrote Joab Jackson for IDG News. 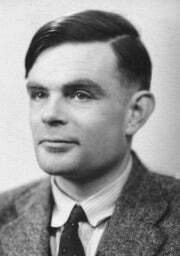 Jackson noted that during World War II, Turing was instrumental in cracking German encrypted messages, allowing the British to anticipate Germany's actions and ultimately help win the war. As for his math achievements, he devised a conceptual computing machine called the Turing Machine that would use an infinitely long piece of tape containing a series of symbols. A machine head could read the symbols and add its own, as well as move to different parts of the tape, one symbol at a time. Since infinite tapes obviously don't exist, a Turing Machine couldn't actually be created, but the concept brought to life invaluable and transformative ideas. Modern day computers use the binary logic of 1s and Os and work like the Turing Machine, minus the tape. That's where Google's doodle comes in. If you're itching to get some binary action of your own, head over to Google's homepage where the cryptic doodle lies in wait for you to figure out. Here’s a clue: the object is to spell Google's name and by switching the numbers and hitting play, you can do it. Over the years Google has produced more than 1000 doodles. This one could be difficult to figure out. Still need help with it? There's a video of the doodle in action.